Joana Stern has an unfortunate preference for videos that put their key points at the end. Nonetheless, she often has a unique perspective worth the view. The newest watch can detect hard falls and alert emergency contacts. WSJ’s Joanna Stern enlisted a pro to trip, slip and flip through some serious testing. Don’t try this at home. 2015—A very slow wrist computer? A fancy-pants watch? A Fitbit with bad battery life? Apple didn’t quite know, but shipped the Watch anyway. 2016—Scratch that. It’s a fitness wearable. With better activity tracking, GPS and water resistance, the Series 2 Watch gobbled up a chunk of the fitness-tracker market, but it still suffered from poor battery life, especially during workouts. 2017— Apple added cellular connectivity (not without hiccups) and a faster processor to the Series 3, but it was still the same ol’ thing. 2018—With a bigger screen and powerful health additions, Apple’s Series 4 wearable is a lot nicer to use and finally makes a lot of sense—and not just for young people who know what burpees are. I guess you could call this the I-told-you-so review. Over the past few years, I’ve said the Watch is a good fitness device but various aspects needed more time. The Series 4 feels like it has been through a needed maturation process, with refinements to the screen, the battery, the cellular connectivity and more. And its new potentially lifesaving EKG and fall-detection features make it desirable for people who might well remember the Eisenhower administration. I still don’t love the squircle shape of the Apple Watch, but the expansion of the Series 4’s screen by over 30% and the slight slimming of its potbellied underside make the Series 4 more comfortable and attractive. Going from the smaller screen to the bigger one is like putting on a pair of reading glasses. You no longer need doll hands to tap the complications—those doodads on the watch face that show weather, activity and other info. Some new watch faces, like Infograph, go overboard on those. Complication, indeed. The Apple Watch is still not as good as an $85 Fossil watch at showing the time. Without an always on screen, I have to flick my wrist or turn the digital crown. If you’re interested in the Series 4’s Food and Drug Administration-cleared electrocardiogram feature for advanced heart-rate monitoring, you might be disappointed to learn that I couldn’t test it. Although the new watch has the necessary hardware inside, Apple’s EKG app isn’t due out until later this year. I did test the other major health addition, however. 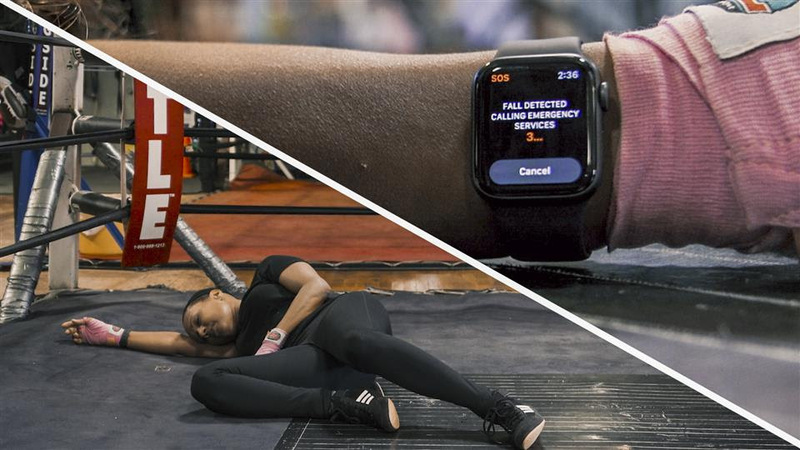 In what appears to be a clear competitor to Life Alert, the Series 4 detects falls using a new accelerometer and gyroscope. During setup, if you enter your birthday and are 65 or over, the feature automatically turns on. If not, you can turn it on manually in the Apple Watch’s iPhone app, under Emergency Services. During my two weeks of use, the Watch never issued a false positive. No matter how hard I tried to slam my hand on the desk or fall onto my couch, I couldn’t trigger it. So we hired Evelyn Osorio Vaccaro, a professional stunt actor who falls—hard—for a living. During a series of at least 20 slips, trips and backward falls, the Watch detected them all—with the exception of a forward tumble down a hill. In each case, it buzzed with an alert reading, “Looks like you’ve taken a hard fall” and an option to call emergency services. When Evelyn remained immobile for about a minute, it began a 15-second countdown to calling 911. The testing proved just how powerful the Watch is as a hyper-connected medical device and not just for older people. Just last week I saw a 20-something on an electric skateboard, looking down at his phone. I wanted to stop him so I could lend him the Watch. Five minutes into my Saturday morning run, the automatic workout detection kicked in. Unfortunately, it only picks up running, walking and a few other types of workouts, something I learned the hard way, 20 minutes into my SoulCycle class. The new activity competition feature—in which I am currently losing to a co-worker—at least got me to walk the dog for an extra 10 minutes. What I’d really like is for WatchOS to push me harder by, say, suggesting variations in my workout routine. The new hardware does mark the Watch’s progress as a workout companion. With just my AirPods and the Series 4, I went for a two-mile run. With four bars of Verizon service, I streamed my favorite ’80s Apple Music playlist and while walking home got a clear and crisp—albeit annoying—call from my wife to pick up milk at the store. When I leave the house, there’s still a 30-second drop before the cellular handoff. While improved, it’s still annoying when my music suddenly cuts out. My 20-minute run, dependent on cellular and GPS, ate up 10% of the battery, substantially better than with the Series 3. The Watch can go longer—up to 1½ days—when it relies on Wi-Fi or my iPhone for connectivity. The battery still doesn’t last long enough to sleep with the Watch, which is probably why Apple hasn’t introduced sleep tracking yet. I’ve never bought into the Watch as a mini smartphone. Most of the time, our phones are in arm’s reach and are better than something with a screen the size of a Listerine strip. There are two exceptions. First, Apple Pay. Two taps on the side button beats pulling out my iPhone. Second, the Watch has become surprisingly useful to me in my quest to limit my phone usage. Without the temptation to tap Twitter or Instagram, I can still get messages and see the time. We still deserve a better way to prioritize notifications, though. Bourbon aged for less than four years is supposed to say so on the bottle. Apple Watches should do the same. Whether you’re upgrading from an older Apple Watch or have been waiting to buy one, look for the 4 on the box. —For more WSJ Technology analysis, reviews, advice and headlines, sign up for our weekly newsletter.